Rabbi David Wirtschafter has been serving Temple Adath Israel and the Lexington community since 2015. Prior to that he worked at congregations in New York, California and Iowa, and served as rabbi-in-residence for the Minneapolis Jewish Day School and the Jay Phillips Center for Interfaith Learning. He taught and was a guest lecturer for the JCP’s academic partners, the University of St. Thomas and Saint John’s University, both in Minnesota. 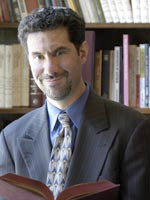 A graduate of Brandeis University and Hebrew Union College –Jewish Institute of Religion (North America’s seminary for Reform Judaism), Rabbi Wirtschafter remains dedicated to the values at the core of his education and training: devotion to learning, commitment to inclusion and working for justice. He regularly contributes reflections and prayers to the blog site for the Union for Reform Judaism, and loves to write rhyming short stories for children.